All thoughts and prayers go out to all our service families. My Dad was in the Air Force and my oldest son in the Army. We appreciate the freedoms they have all paid a high price for. In being quite and reflective today I got to spend a little time in my card room. Here is a quirky take on the Monday Lunchtime Sketch Challenge #71 over at http://technostamper.blogspot.com, I'm still pretty new to challenges so I hope it will qualify. My camera work is still a little blurry, I'm working on that. In the pebbles on the flower it says,"Dream A Little Dream". Supplies: Mint green card stock, saffron card stock, CTMH #Z9012 Promise of Spring Paper Pack, Ranger: Dusty Concord Distress Ink, Peeled Paint Distress Ink, Sponge from $ Store for sponging(the yellow automotive ones), Martha Stewart punch, Making Memories: Page Pebbles, Hero Arts: Adhesive Crystals. Well that is just beautiful. Love the colors and those leaves. Fabulous job. Thanks so much for playing along. Love the color combo and the card size reminds me to switch it up from time to time. 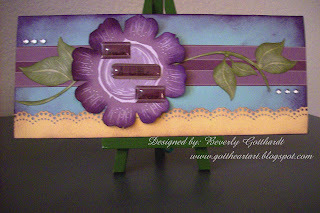 What a lovely card this is....wonderful colors...just fabulous!